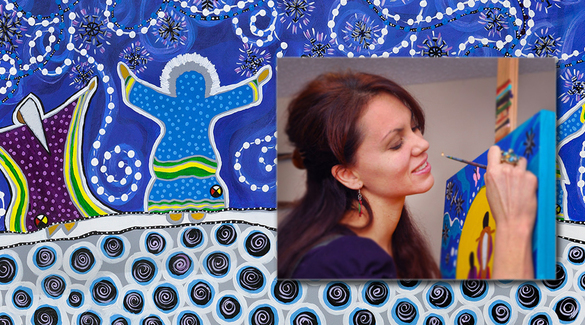 Saskatchewan NAC is very pleased to feature Prince Albert artist Leah Dorion as a NAC Artist of the Month. Leah was born in 1970 in Nipawin Saskatchewan and grew up in Prince Albert. 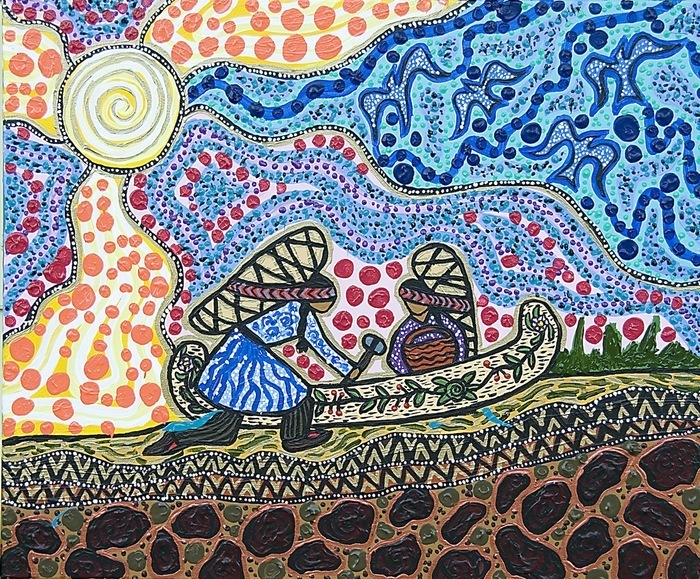 She counts her Metis heritage as an important influence on her throughout her career, which has included studying Native Studies and Education and working as a teacher, in addition to her artistic practice as a painter, filmmaker, and writer. 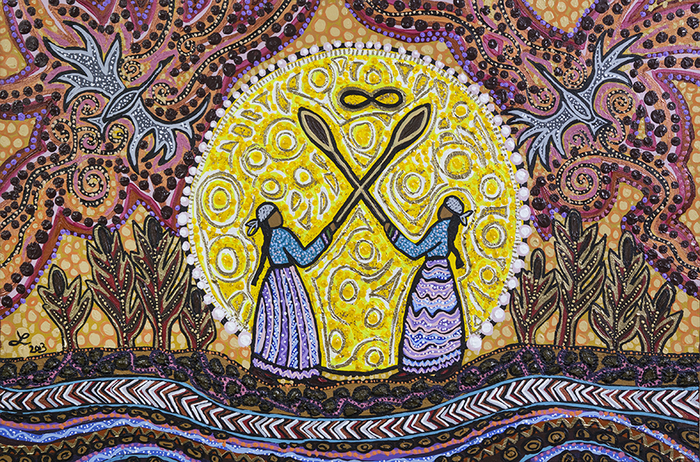 Leah is a self-taught visual artist, and her work combines contemporary styles with traditional art forms, adding beadwork to her paintings that explore light, movement, and texture. 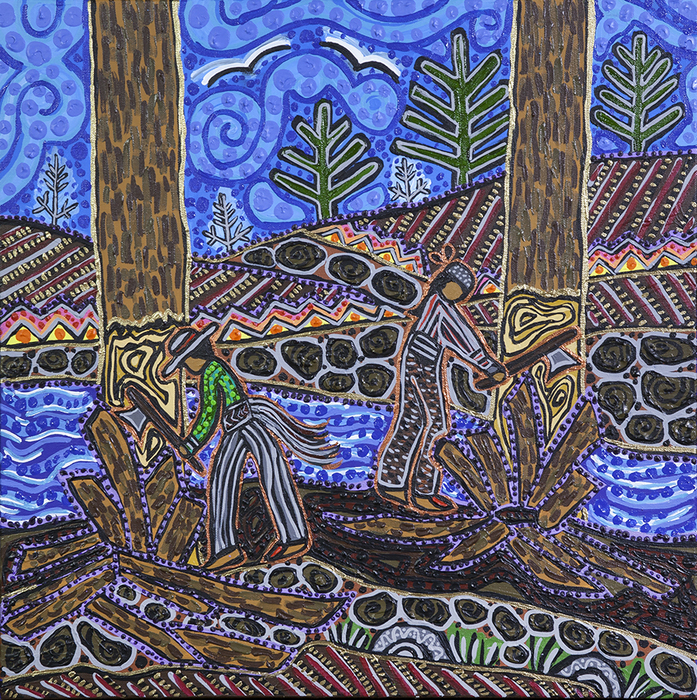 Leah's themes include Metis culture and history, spirituality, and the roles of Aboriginal women. 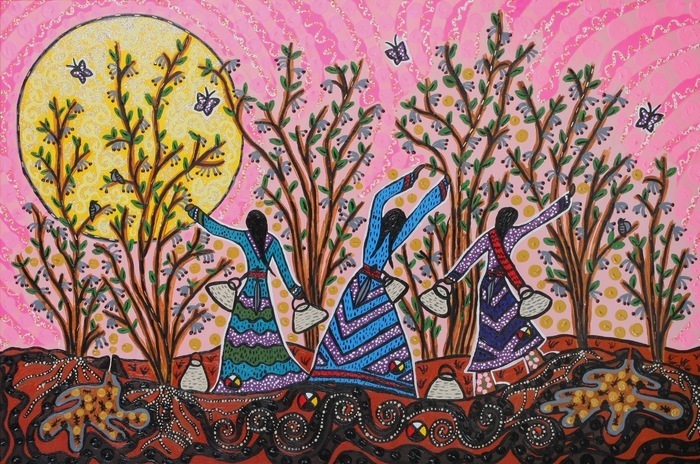 Leah's work has been shown in Saskatchewan and Alberta and in numerous posters, calendars, and magazines. Her publications include The Giving Tree: A Metis Story about Giving and Receiving (2009), which she wrote and illustrated. Leah has been involved with several arts organizations, including CARFAC, the Saskatchewan Arts Board Aboriginal Advisory Committee, and the Canadian Society for Education in the Arts, among others. Below are some examples of Leah’s work currently available for purchase through our NACmarket, and an interview with Leah from May 2014. As a child I always enjoyed drawing and making up my own stories and illustrating them. But it wasn’t until about ten years ago that I began developing my own artistic practice for personal healing and wellness. Today, I have a diverse artistic practice and use many forms of artistic expression to tell stories and share my cultural knowledge. 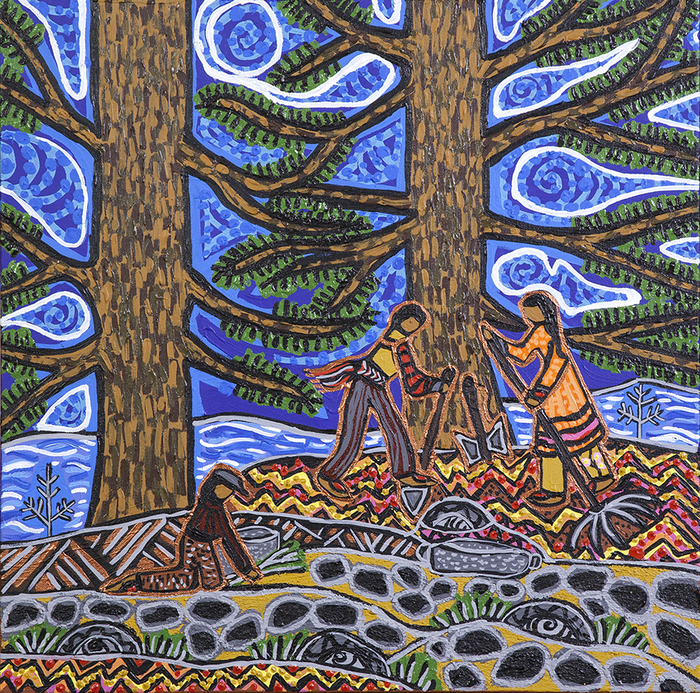 I like to work in acrylic and canvas, and land based installation art is another area of my practice that I continue to develop, such as building Lobstick Poles and making rock Turtle Labyrinth paths. 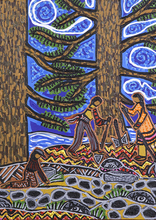 My First Nations and Metis cultural background is the primary source of inspiration for my artworks. 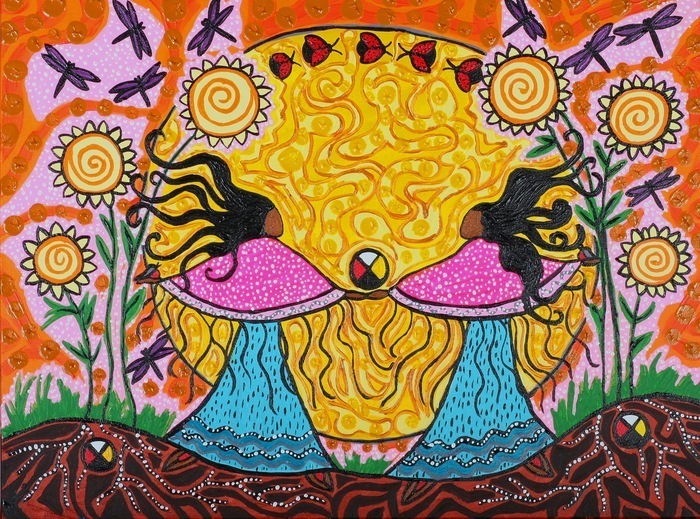 Aboriginal women’s knowledge/teachings and connection to this land are the foundations for my artistic practice, and I use the circle of life and medicine wheel teachings in the thematic and symbol systems used in my art. I consider myself an interdisciplinary artist, and use writing, video, environmental settings and voice to express myself. I love children’s books and art made for and by children. I like abstract and conceptual artwork without all the real details. 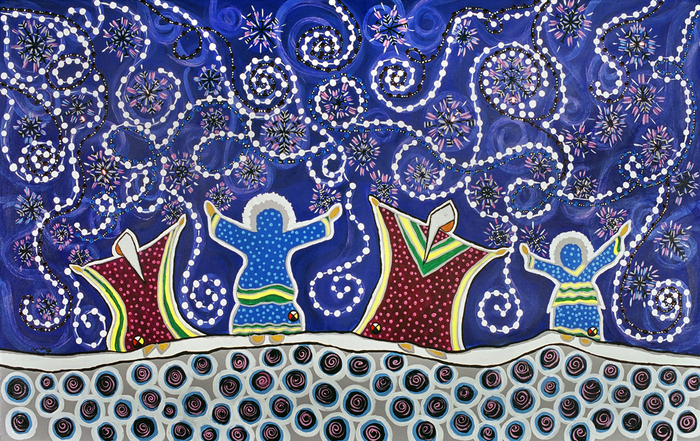 Aboriginal artists like Norval Morriseau, Sherry Farrell-Racette, and Christie Belcourt are some of my greatest influences. 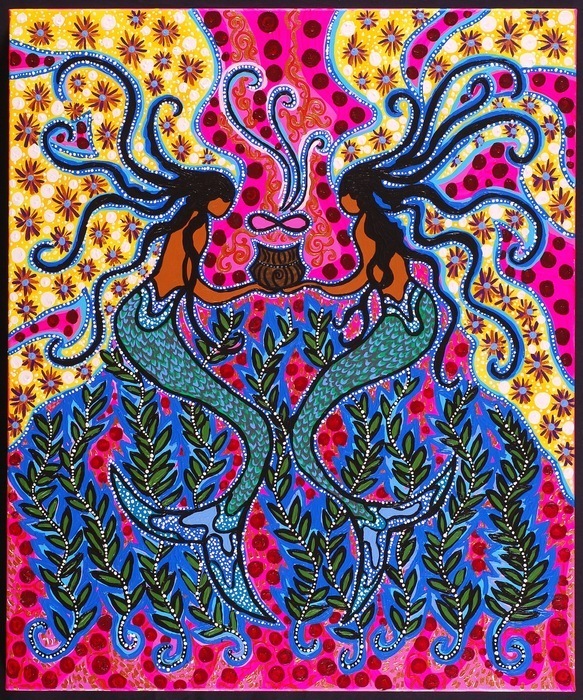 I admire all the Aboriginal symbols and symbols systems that represent greater philosophical concepts or ideas. 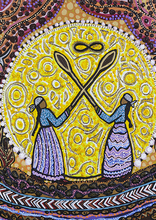 I most admire the people who practice the traditional cultural arts especially beadwork artists, such as my auntie Isabelle Impey. 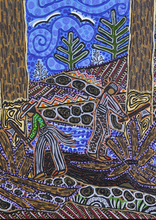 I appreciate the individuals who work with birch bark, hides, woodworkers, gardeners, and other traditional mediums. I know how much knowledge and patience it takes to make these works. My father was a carpenter and my mother is super creative. I am so blessed to witness them collaborate on many amazing projects. I learned from my parents that anything is possible and I learned that hands and imagination can bring beauty into existence. I would describe my work as molecular and elemental. I always represent nature and the four elements that give life, such as the air, earth, fire, and water. I like incorporating the circle into every aspect of my designs, and it seems that the sun is often represented in my artworks. My work is very feminine and ends up having a beadwork type look in some regards. I have no fear about using bright colours and celebrating bold patterned designs. Even though the paintings can be quite busy with multi-patterns and numerous pointillism dots these works can have a calming effect. How did you start creating art in your particular style? I am a self-taught artist with no formal training. I play and experiment with different mediums and try to have fun. I find art making meditative, experimental, and very spiritual. It is my personal creation time that I use to pray and center myself in a sometimes frenzied fast-paced world. 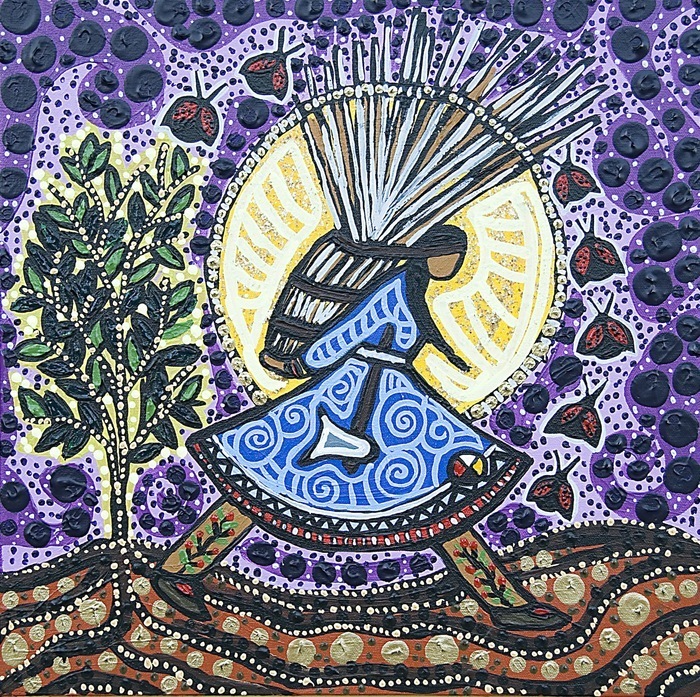 Earth based spirituality permeates my art work. It just comes naturally for me with my deep passion for the earth and interest in sustainable and balanced living. Art making takes time. It is process oriented, and requires discipline and patience to complete a body of work. It can be frustrating to work within specific deadlines and parameters. However, the joy art brings me outshines any limitations. How has living in Saskatchewan, and the area around Prince Albert, shaped you as a artist? The river and parkland zone near Prince Albert has infused my identity. I love coming from this region because we have the farming culture and forestry all within our region. I feel that I get the best of both worlds living here as I have the prairie flowers and northern bush which inspire me and my work.